Egypt witnessed a growing number of sectarian incidents in the lead-up to the forced deposal of President Muhammed Morsi in June 2013. Seeking to contextualize these events, this book investigates challenges and dangers with the politicization of religion in contemporary in Egypt. 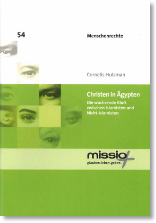 With the permission of the publisher, this paper was published by Arab West Report, under the title Christian Victims of the Growth Islamist non-Islamist Divide; The Urgent need for Peace and Reconciliation.